I made myself some handwarmers for the winter season using a hybrid of the pattern from Joelle Hoverson's (owner of Purl Soho ) book Knitted Gifts - and the Herringbone Rib Stitch shown in Vogue Knitting's Stitchionary. Our family dog Shadow needed a cute little hat for the holidays. Shelbie was ever so helpful and knitted him a particularly cute one on Christmas eve. I rather adore the little pompom and how his little ears stick out of the ear holes. Shadow put up with it for a while, but he kept taking it off and hiding it. Much to his chagrin, whenever we found him without it we found his hiding place and put it right back on. It was just too cute not to! My mom gave me this beautiful Japanese book with Japanese crochet patterns in hopes that I would make something for her. As part (most) of my mom's Christmas present , I made the scarf on the front cover. I changed up the color scheme for for one with more bold colors - attempting to make red (her favorite color) the main theme. 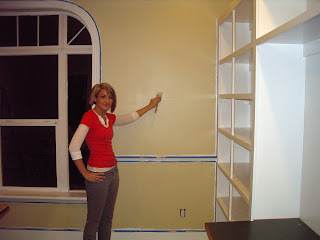 The end result is shown below. It was a fun project, and I have a feeling I will be doing more crochet in the future! In the fall I knew I wanted to put some of Lizzy's books in the bags I was making for my daughters and I wanted to get some extras for friends. I ordered them in advance and I'm so glad I did. They are just beautiful and each is unique. 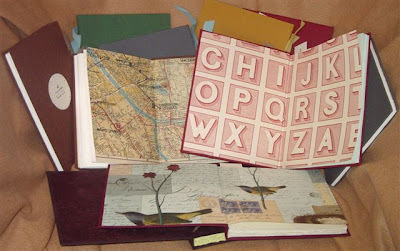 I think they will make great journals or sketch books for the girls. Laurie didn't want a bag but she got a Lizzy book and a zipper bag to keep her new Ipod in and she was happy with that. Jamie calls her book "my book of rhymes" as she is writing raps in them to be the first girl rapper from Utah. 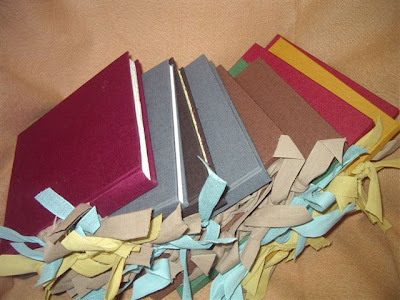 (like there would be another one) Each book had a personalized description from Lizzy about the paper and ribbon. She's so talented. 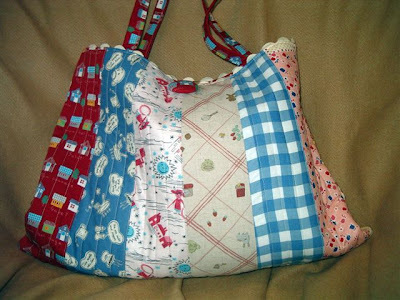 Shelbie's bag - it's for knitting and squared off at the bottom so it can sit on the floor and hold a box she keeps with some notions in it. I also got her a knitting needle case from Etsy. 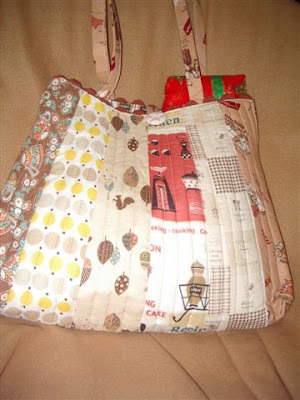 This bag is made from Japanese canvas with leather handles I bought that just crimped on. Jamie's bag - may never be used. 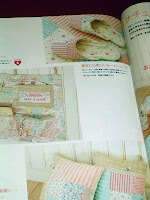 It has a combination of vintage, new and Japanese fabric. 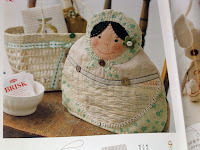 I got the pattern from one of my Japanese craft books but I had to use a lot of imagination since I don't speak Japanese. 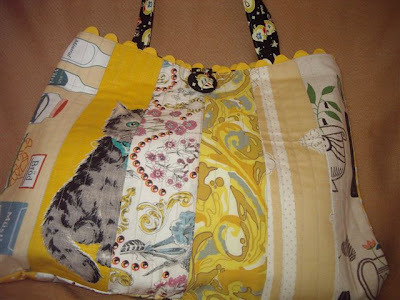 Chelsey wanted a yellow bag again from vintage fabric (the cat is a linen dish cloth), new fabric and Japanese. I like the rick rack at the top. 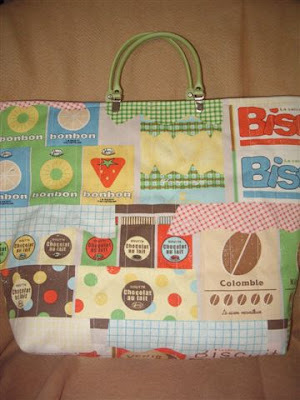 This is Tracey's bag and its full of her Christmas presents. 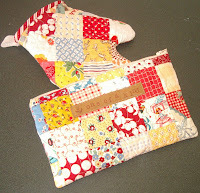 After making Jamie's bag I changed the pattern completely in size and scale. 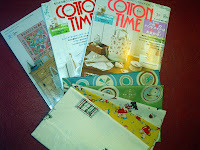 Also, new, vintage and Japanese novelty fabrics were used. Whitney's bag, also full. I got her a knitting case from Etsy, too. 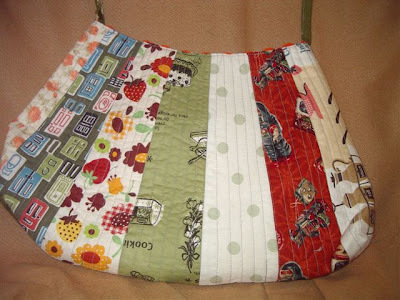 Same type of fabrics used in this one. Natalie likes owls. 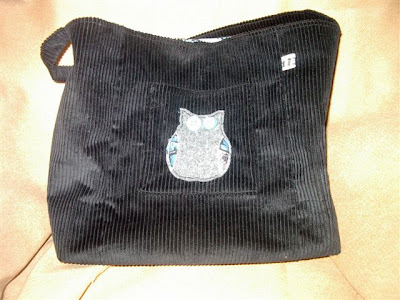 It might be hard to tell from the photo but hers has a wool owl appliqued on the pocket. 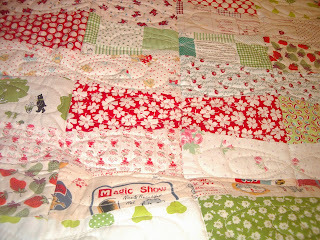 The lining is some vintage fabric she got on a trip with Justin to Michigan. Inside Natalie's bag. 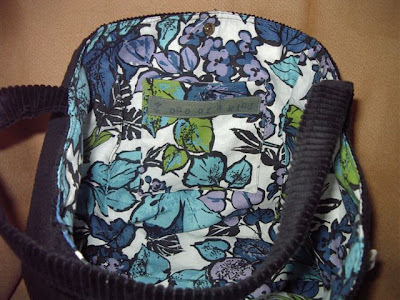 Most of the bags have 1-2 pockets with my "one of a kind" tag on them. This is a little gift that I gave to my female co-workers. I used either a light blue yarn, or a variegated yarn, created by dying some habu textiles yarn with kool-aid. I should have credited the pillow to a gift from my sister-in-law, Lorraine, from a few years ago. 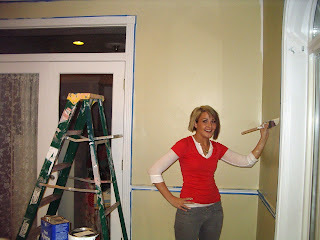 I made quilted curtains last year about this time for my newly painted yellow kitchen. However, since our summer flood/disaster/forced remodel they really don't go with my new granite countertop and stone backsplash. I haven't decided what I'm going to make in their place yet but this last week I took them down and recycled them into some gifts. Since last Halloween of '06 i have wanted to make myself a cape that i could use as a coat. The idea came from an adorable witch my best friend Sarah made. It was made out of a purple wool and i just fell in love with it. After I finished my first real knitting project in September, the arrowhead lace caplet, i finally decided to buckle down and get it done. 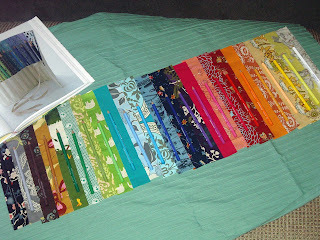 Then I purchased my fabric at fashionfabricsclub.com . I used a really pretty and soft black flannel coating and some Amy Butler fabric from her Lotus collection. 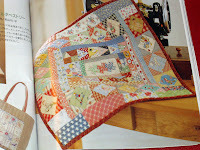 When ever I get a package of fun fabric or a good quilt book I take full enjoyment from petting the fabric and pouring through the pictures in the book. Its such a treat. My mind starts filling up with ideas and plans. And thats the best part of a new project - the dreaming and planning. This came yesterday from Kitty-Craft. 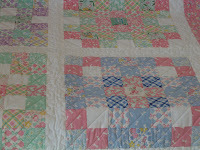 This is one of the quilts I sent to Fons and Porter for their baby quilt contest. 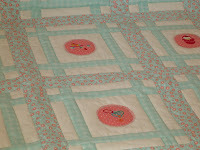 I made 5 baby quilts and rules stated they had to be "original designs". I thought my take on making a tumbler block into a bow was kind of clever. I knew tumblers weren't completely original but I do like my use of fabric and color and making them into bows. 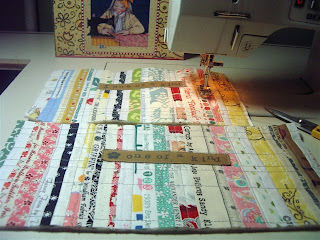 Yesterday I stumbled on a blog by Kelly and saw she has a similar design and has sold darling kits for this quilt. 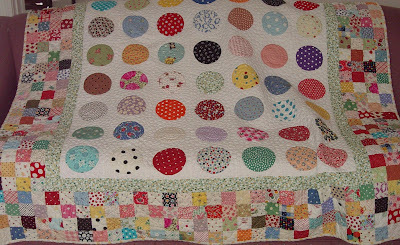 Since I've made my tumbler quilt I've seen several like mine. I think the shape of the block is really pleasing and all in all it was a good experience making it. 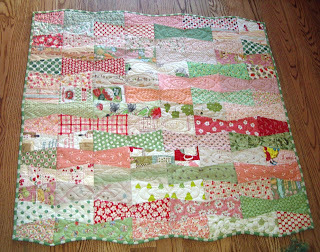 I will continue to use this pattern and idea for gifts and baby quilt sales. 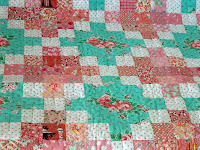 I love using vintage fabric along with new fabric and Japanese reproductions and I try to incorporate vintage fabric into every quilt I make. 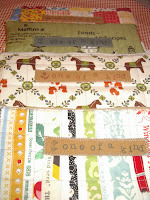 Pieces coming together for small gifts. I put my label "one of a kind" on the outside just for fun. 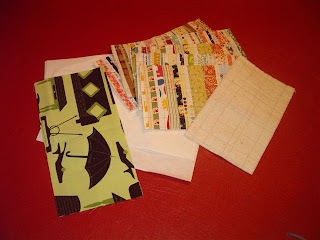 I am making some gifts with this "homemade fabric". 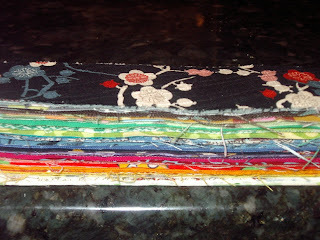 I got the idea of using selvages in a project that Manda did at Tree Fall Design. She made pin cushions that are darling. Who is Freda and what is her hive?